Conjuring the bleakest biblical sound and the desperately fervent devotion of the bygone days of revelation, King Dude, aka TJ Cowgill, has been on a sinister and demonic trip to the fabled crossroads, accompanied by the spirit of all those who went before him. Using the power of the blues, albeit stained black and drenched in blood of his predecessors, King Dude finds hope and salvation in glorious yet spellbinding hymns, equal parts classic country, gothic Americana ballads, and harrowing British folk at its heart, but embellishments like the heavier sounds of Heavy Metal and warped, echo drenched rockabilly tend to sneak and slither their way into King Dude's own brand of harrowing American music. 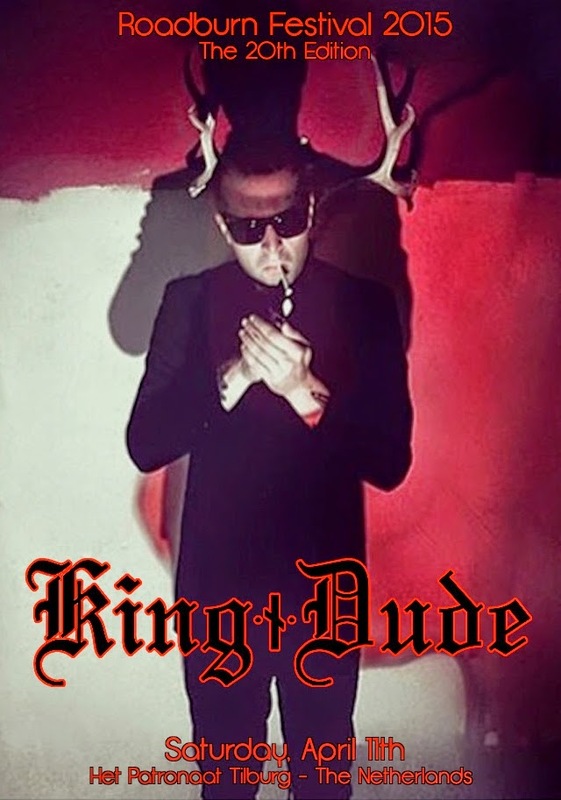 A darker, much more shadowy version of Johnny Cash, King Dude is a modern day man in black, ephemerally running the musical gamut between Wovenhand and Der Blutharsch. His death ballads from beyond will lift us up from our darkness of ignorance towards the ever guiding light at the 20th edition of Roadburn Festival on Saturday, April 11 at Het Patronaat in Tilburg, The Netherlands.